to transfer to the new website. Thanks! Compatibility with other MPE Products. Support services - standard, extended and advanced technical support. The VFX Forth for Linux family consists of 32-bit x86 and 32-bit ARM versions built from the same code tree as the Windows and Mac OS/X versions; please refer to the Common features page for a more detailed description of aspects common to all versions, e.g. code generation. The current release is v4.7. This release includes code generation changes, an improved shared library interface, the GTK+ cross-platform GUI code, a port of Bernd Pasan's Minos and Theseus GUI designer, and Hanno Schwalm's fJACK audio interface. Free downloads of the x86 version of VFX Forth for Linux are available from the Southampton server. Login as "public" with a blank password. Select the VfxLinEval directory. Please read the file ReadMe.Linux.txt before you install the system. The 32 bit VFX Forth for Linux version is available in rpm and deb packages for 32 bit and 64 bit x86 Linux variants, and as a tarball. VFX Forth for Linux also works on FreeBSD with the Linux compatibility layer installed. The paid-for releases include more features and a version for embedded use on 386 and 486 class CPUs, such as those in the Ebox range of low-cost industrial/network PCs. The ARM version works on all 32 bit distributions that support the EABI - that's most everything these days, including the Raspberry Pi and the Beaglebone Black. Read the latest release notes. Release notes for all earlier versions of VFX Forth can be found here. For the licence terms, see the licence. "Besides the amazing optimizing compiler, I love the DocGen documentation system. The easy C interfacing and Genio driver architecture have also been key for my project. And finally, I can even generate turnkey apps customized for my eBox 2300SX." 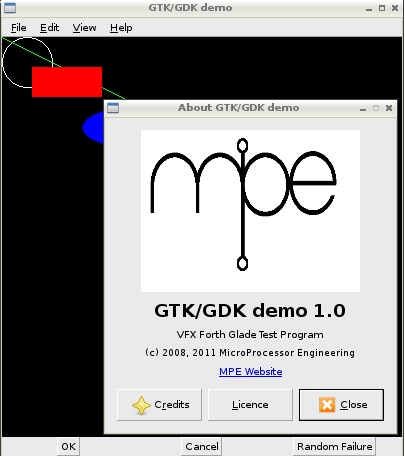 We have settled on GTK+ as a suitable cross-platform GUI library. Now that we have VFX Forth for Windows, Mac OS X and Linux, it was time to take the original Linux interface more seriously. 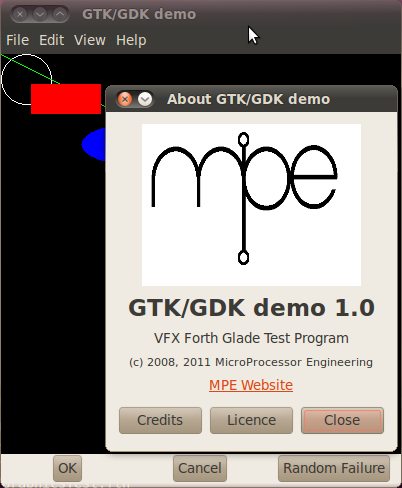 Now the GTK+ interface is cross platform, so it's one of the common features. The four pictures are from Windows, Mac OS X, x86 Linux and ARM Linux. All four were produced by compiling the same source code with no changes. The library interface file contains a small amount of conditional compilation for library file names, but that's all that changes between operating systems. Minos is an OOP-based GUI display system and widget library written by Bernd Paysan, ported to VFX Forth and released under an LGPL license. It is dependent only on the presence of the X-Windows libraries and the OpenGL libraries for graphics displays. As a consequence, it uses little RAM and can be used on low-powered systems. 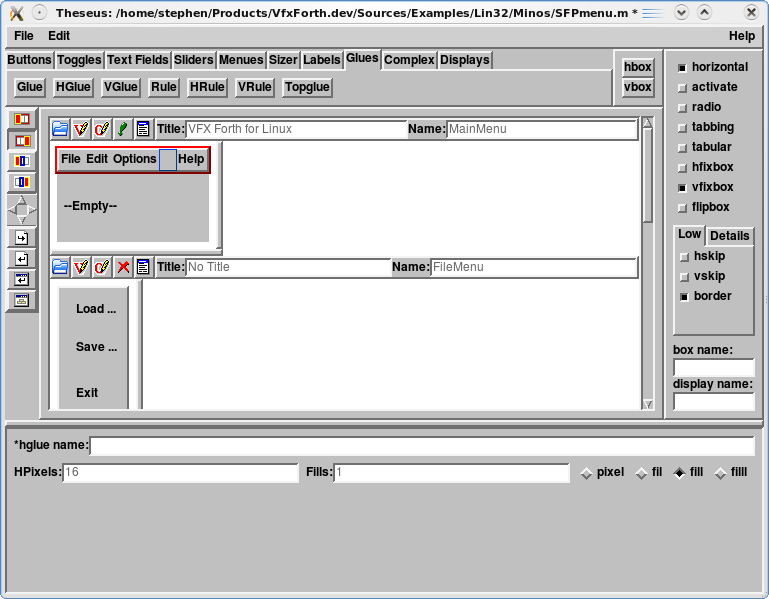 Theseus is the GUI designer component, also by Bernd Paysan and released under LGPL. The screenshot below shows it in use constructing a prototype GUI front-end for VFX Forth. LGPL exemptions and technical support contracts for Minos and Theseus are available separately. Minos and Theseus are supplied with all editions of VFX Forth for Linux. VFX Forth comes with a wide range of application examples. Libraries include multitasking, floating point, serial and socket-based communications, benchmarks, BNF parsers, binary overlays, full file system support, and more than a dozen application-oriented examples to get you off to a flying start. VFX Forth for ARM Linux includes a direct GPIO access example for the Raspberry Pi with a bit toggle rate of about 10 MHz using the generic GPIO functions, and somewhat faster using functions dedicated to the peripheral pin. Root privilege is required. This example can easily be modified for other ARM Linux platforms. It is particularly useful for writing simple peripheral drivers in user space, e.g. I2C master - no kernel driver required. x86: Any version of x86 Linux with 32-bit libraries, e.g. any Red Hat or Debian distribution or derivative. An x87 compatible maths co-processor is required for floating-point maths. ARM Any version of ARM Linux with EABI support and 32-bit libraries, e.g. any Red Hat or Debian distribution or derivative. A VFP floating point unit is required for floating-point maths. 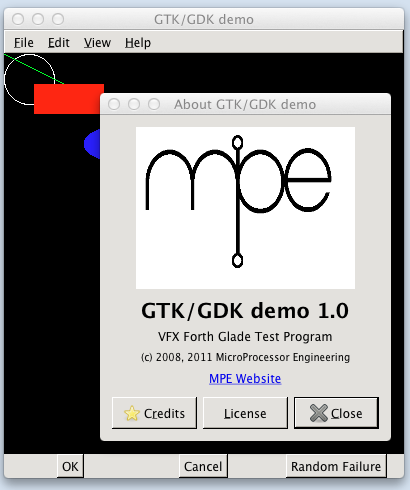 The VFX Forth kernel is source-code compatible with MPE's Forth cross compilers, and compatibility for other versions of VFX Forth for Windows or Mac OS X has been made simple. Evaluation (currently x86 only): Free download from this website. The full system with no timeout, no kernel sources, no cross compiler, no PowerNet and minimal technical support. Not for commercial use. See the licence. 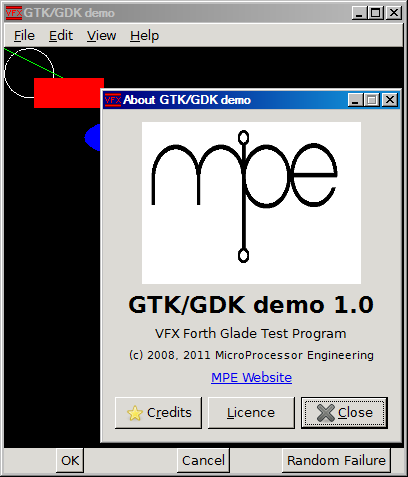 Standard: Full system with turnkey application generation, full kernel sources except for the VFX code generator but no cross compiler or tool source code. No PowerNet. One year of tech support and upgrades. Professional: Full system with the PowerNet web server, all kernel sources and the MPE Forth 7 VFX 386+ or ARM cross compiler. With this system you can modify and extend the VFX Forth system. Requires a Non-Disclosure Agreement to be signed. One year of tech support and upgrades. Mission: Full system with all sources and cross compilers for all supported CPUs and operating systems, and full source for all support tools, including the cross compiler and shared libraries. Requires a Non-Disclosure Agreement to be signed. Note that educational users can obtain all the VFX Forth editions at a 50% discount. Upgrades are available from one version to another. Fax and email hotline technical support on the use of VFX Forth. Within 3 months of purchase any updates are provided free of charge. Go to the pricelist page.